Big congratulations to one of our FB friends Alethea Mifsud! Your name was first out of the woolly hat and you’ve bagged yourself a copy of our new cookbook, ‘Superfood Breakfasts’. Yay! Fish is such a simple way to load up on essential nutrients and omega oils, but make sure it’s responsibly sourced. 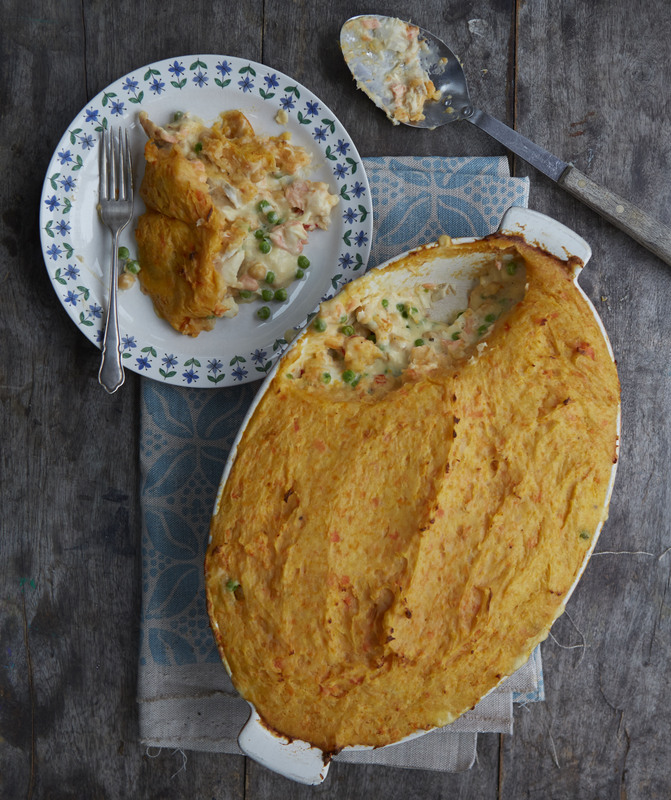 We use our local fishmonger and completely trust that everything they sell is top-notch in taste, freshness and ethics, which means we enjoy our fish pie even more. Yum! We love garlic and use it pretty much every day in the kitchen, so ‘G’ just had to be garlic in our ‘Allotment A-Z’. Last year we had great success with some very tasty garlic called Spanish Roja (an over-winter hardneck variety that packs a huge flavour punch), so we decided to grow it again this year! I love beetroots! They’re so easy to grow and are a totally gorgeous colour. 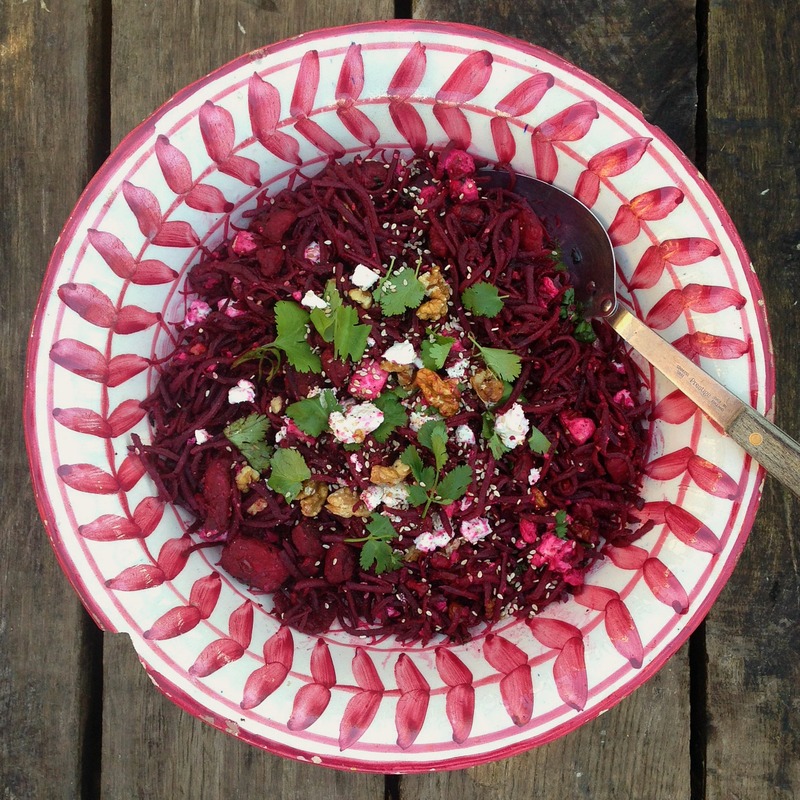 We’ve been experimenting with beetroot in our breakfast porridge and this is the result. 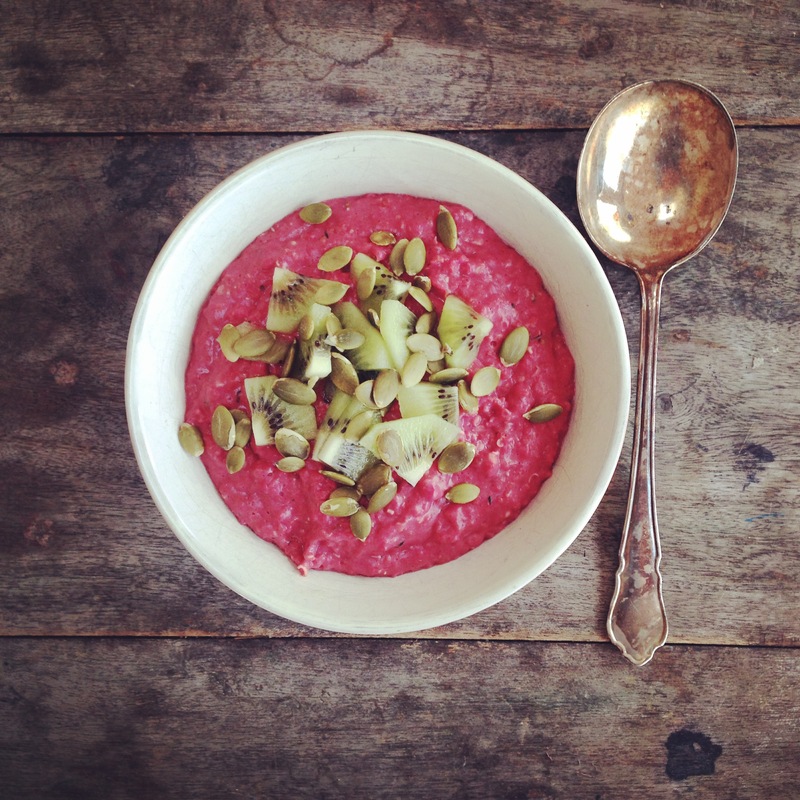 ‘Ta da’… delicious pink porridge! 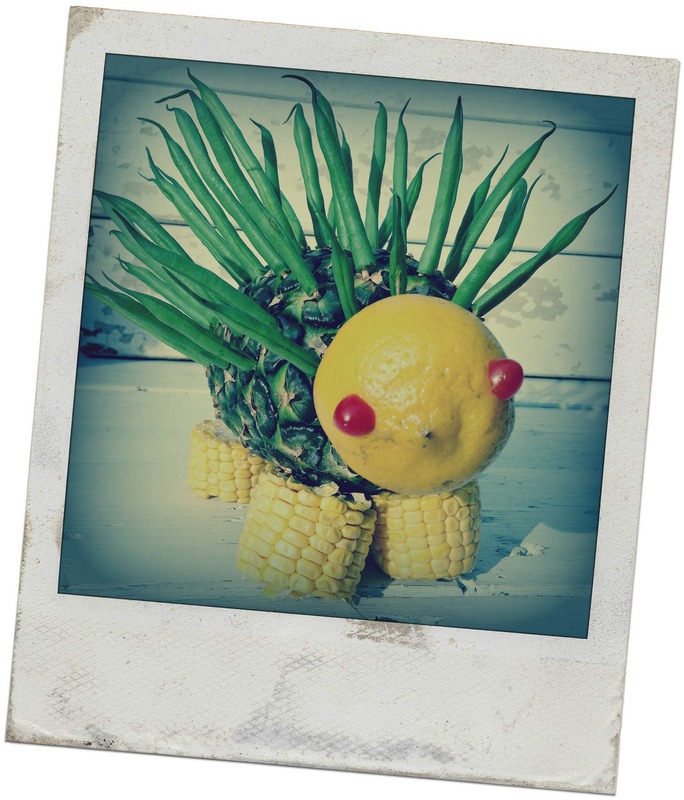 Not only do they taste great, French Beans also make a brilliant fruit & veg ‘creature’ for the local village show! They were one of the first things we grew on our allotment and remain one of our superstar favourites – there really was no competition when it came to choosing ‘F’ for our ‘Allotment A-Z’. We love French Beans! There are loads of fabulous ways to use these beans in your kitchen – delicious raw in a salad or dipped in houmous, lightly steamed on the side, baked in a slow-cooked stew or juiced for breakfast, the versatile french bean is also a doddle to grow. We’ve grown green ones, yellow ones, mottled ones and a gorgeous purple one that looks amazing, tastes great and stores well. Can’t ask for more than that! 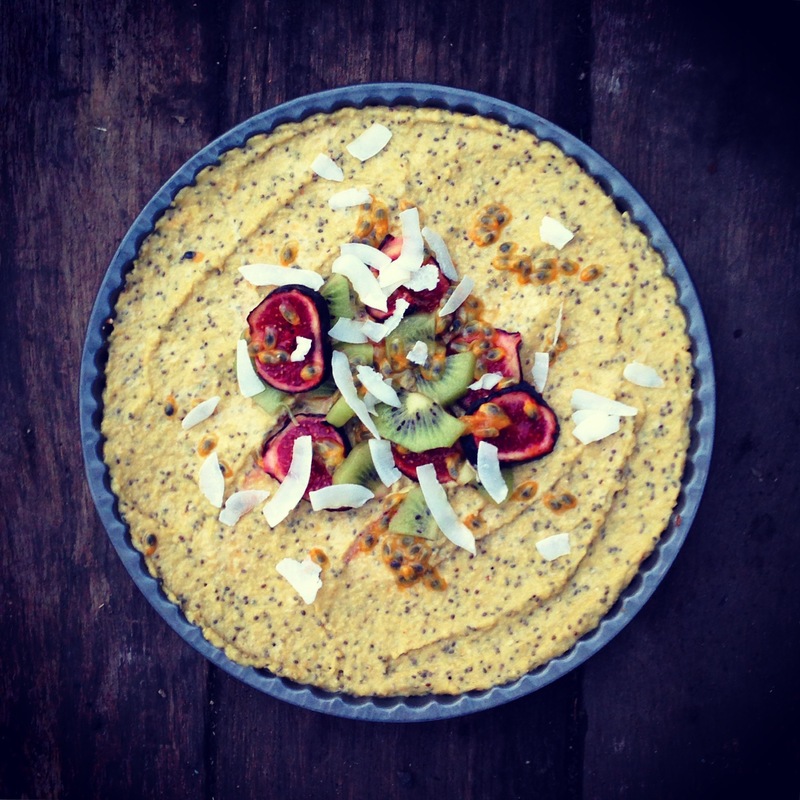 A friend asked me to create a banana-free ‘cheesecake’ for those that don’t do bananas… so here it is! Just as yummy and just as good for you with a little tropical twist and not a banana in sight. Dairy free, gluten free and with no refined sugars, this is the perfect guilt-free pud that won’t give you or the children a sugar-rush before bed. Yay! This was a tricky one! We don’t grow damsons, daikon or dragonfruit on our allotment. 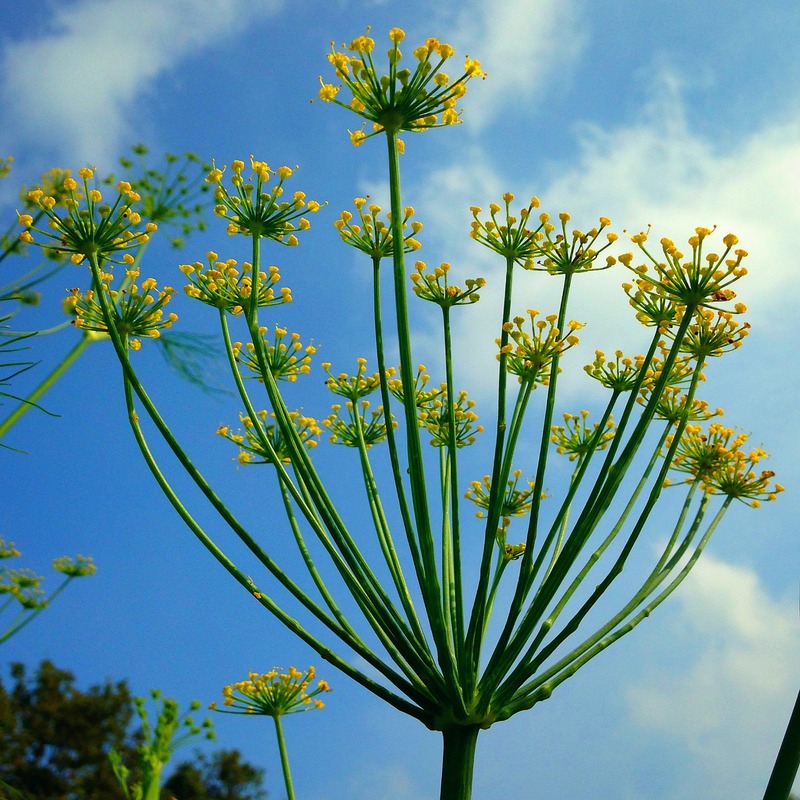 We grow lots of daisies, docks and dandelions and seriously considered ‘D for dandelion’ (so tasty in spring salads), but in the end it was the dainty and delicious dill that got the honour of being included in our A-Z of favourite allotment fruit and veg. Hooray! 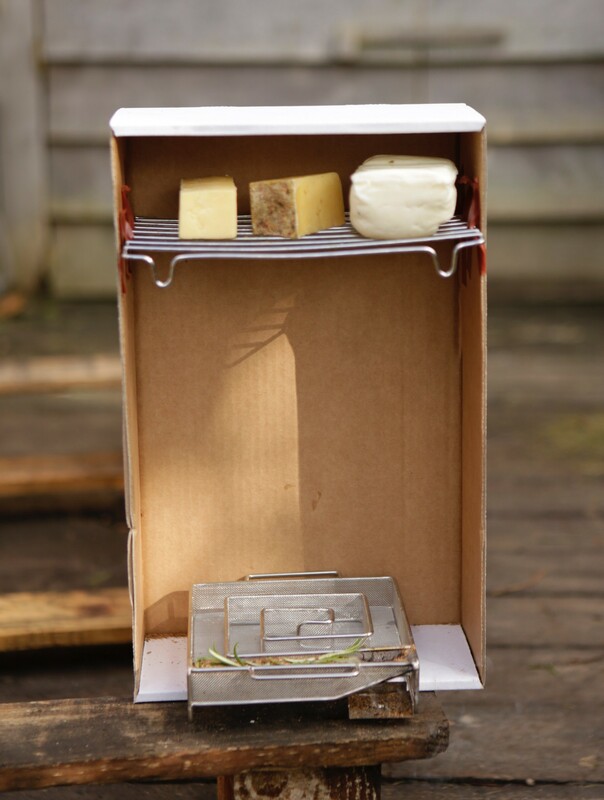 Last week was school half-term and an opportunity to get stuck into some really fun projects with the children, like making this smoke-box for our cheese! I’ve always loved the taste of a good smoked cheese, so it was exciting to see how this turned out. We got some beautiful cheeses from our local organic farm shop – a mild cheddar, a vintage cheddar and an amazing halloumi cheese, all made with raw milk from the farms own herd. They’re already delicious, but we were interested to see what the smoke-box would do! 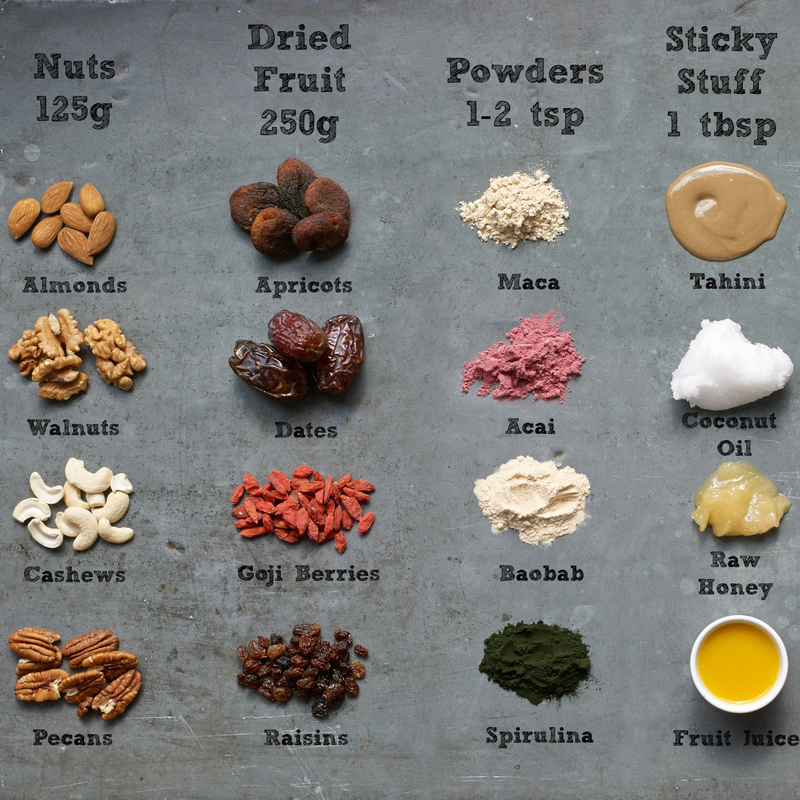 A brilliant little mix & match guide for making raw energy balls, from our new cookbook ‘Energy Bites’. These were the first type of energy balls that I ever made and they’re still my favourite snack! 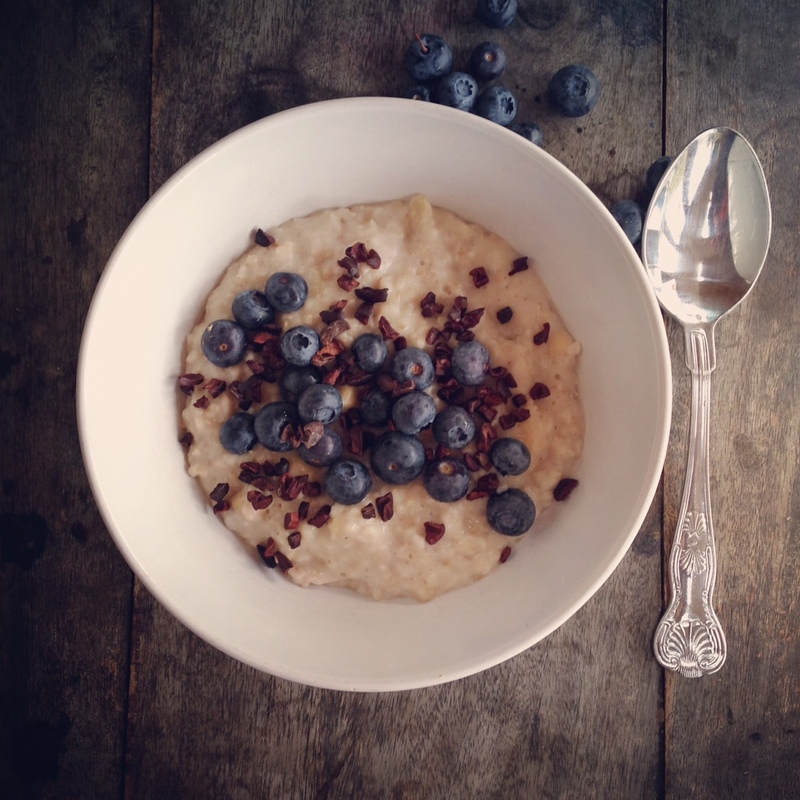 Incredibly quick and easy to make, really good for you and very tasty too. Yay! 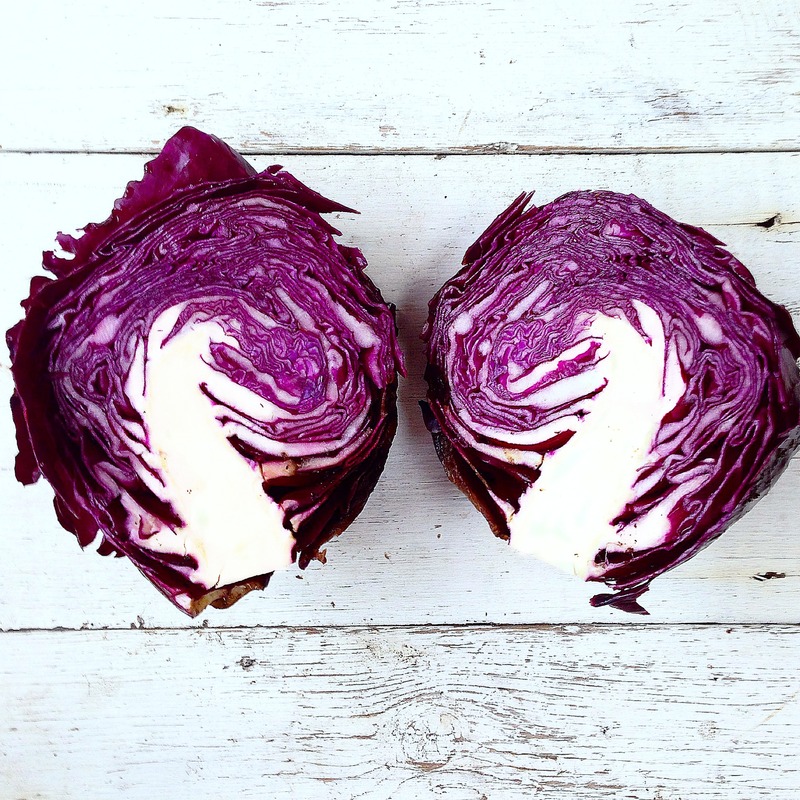 Such an underrated veg, the plain old cabbage is anything but plain, especially in colour! I love growing this ‘Red Drumhead’ variety because it looks fantastic and makes the prettiest coleslaw (as well as an awesome natural electric-blue dye!). Easy to grow and simple to cook, cabbages come in loads of different shapes, sizes and colours and can be grown all year round, so you need never go without a tasty homegrown cabbage in your kitchen! Definitely worthy of their place in the ‘Allotment A-Z’. This is one of our favourite meals for eating al fresco down at the allotment garden. We marinate our halloumi, get the little allotment stove going, pull up a couple of fresh beets and away we go. 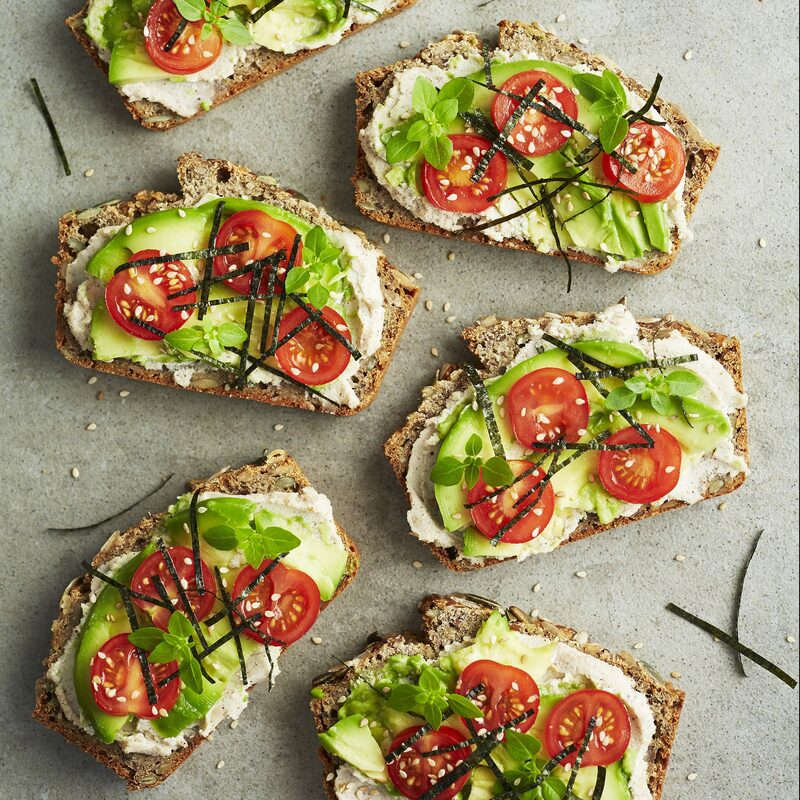 Really simple, really good for you and really tasty. Yay! Fantastic served on the side or as a main, the herbs and spices bring out the amazing earthy flavours, the nuts and seeds add protein and extra crunch, whilst the cheeses are deliciously creamy… and it’s a spectacular colour too! Oh my golly gosh! Delicious. 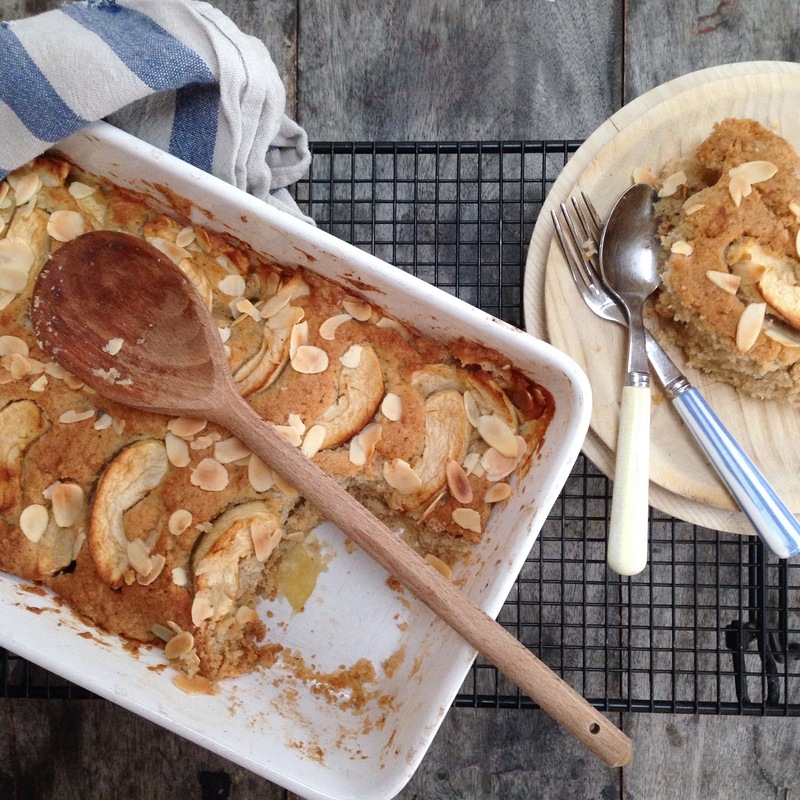 A really simple, seasonal dessert using local apples, that won’t give you or your children a frenzied sugar rush before bed! Woohoo. Dairy free, gluten free and free of refined sugars, this is a traditional pud with a healthy twist! A gardening post – hooray! There have been a lot of food posts lately with the release of our new book ‘Energy Bites’, but we’re still getting our hands dirty in the garden and on the allotment, if only to feed the chickens! 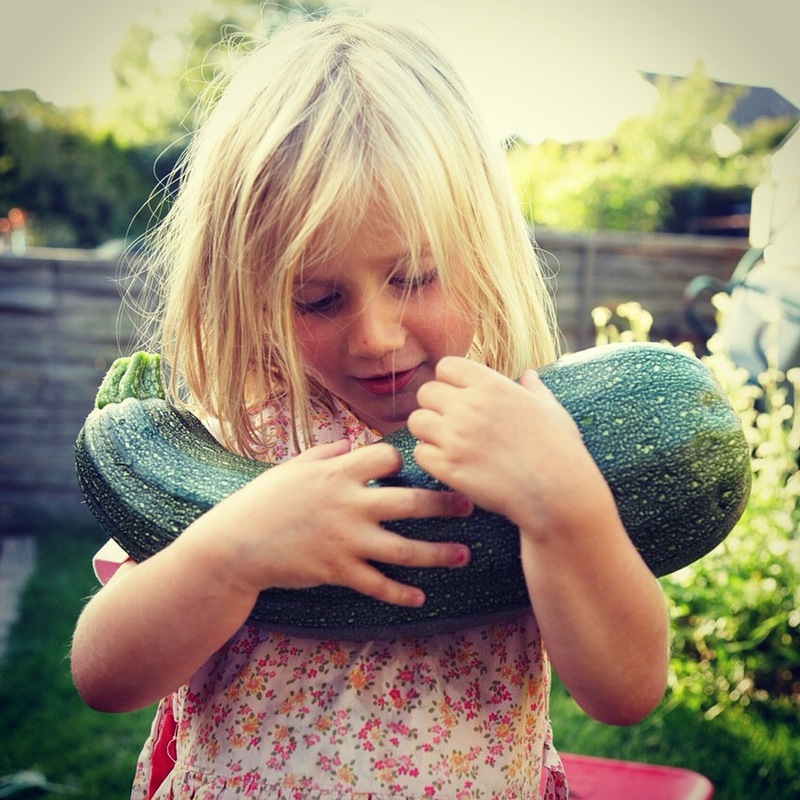 There is a lot to love about gardening, but gardening with children has to be a huge highlight. Our gardens at home and on the allotment are a family affair, with everyone mucking in, tending their ‘patch’, digging, weeding and growing. Being outside is always a pleasure and getting your hands dirty is definitely fun, but watching a seed turn into something that you can eat is absolutely magical! 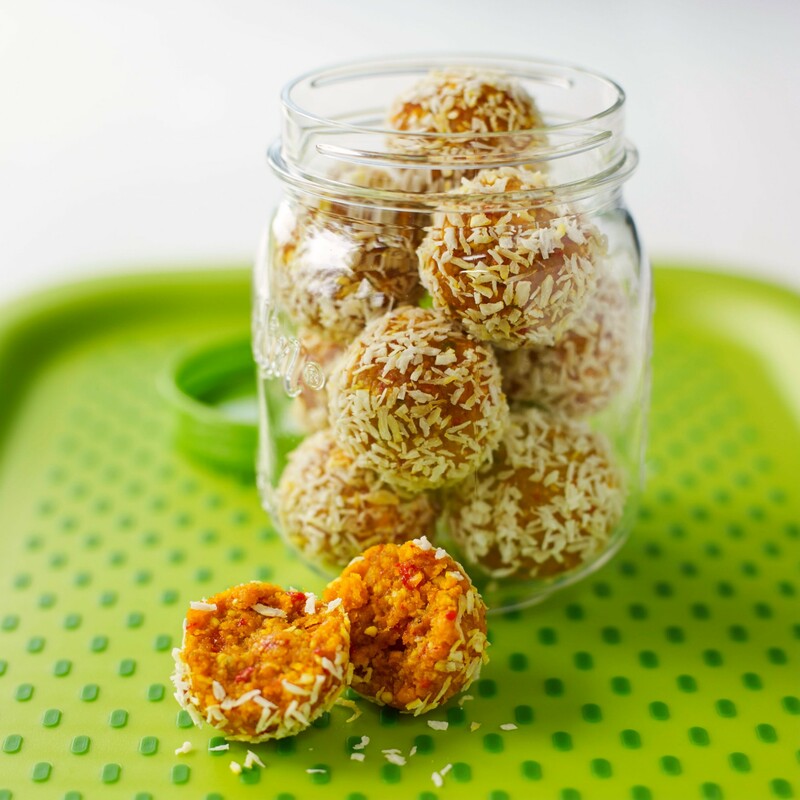 Another pre-publication sneak preview recipe of one of our favourite sweet ‘bites’ from our upcoming book ‘Energy Bites’, which is due out tomorrow! Don’t forget that you can win a copy of the book by simply leaving a comment on the ‘Giveaway’ blog post. These little balls of sunshine are packed with natural anti-inflamatory turmeric and masses of vitamin C-rich mango, goji berries, lime juice, rosehip and baobab, plus nut protein for vitality. Don’t worry if you can’t lay your hands on any baobab or rosehip powders – they’re a great source of Vitamin-C, but the recipe works just as well without them. ‘Free range’ children? What ARE they? I put this question to a group of parents, who said it conjured up images of children running around in the fresh air, nature, fun and laughter. And yes, I wholeheartedly agree. I think being a free range child is about fresh air, connecting with nature, rain, sun, mud and water, but I think there’s more to it than that. For me, free range also means FREEDOM. Freedom for children to think for themselves, freedom to be themselves, freedom to discover themselves and their place in this complicated world and, crucially, freedom from the concerns and worries of adulthood. So how can we as parents support and encourage this type of freedom? "Inspiring a back-to-nature, back-to-basics way of living"
Hello and welcome to Homegrown Kate. 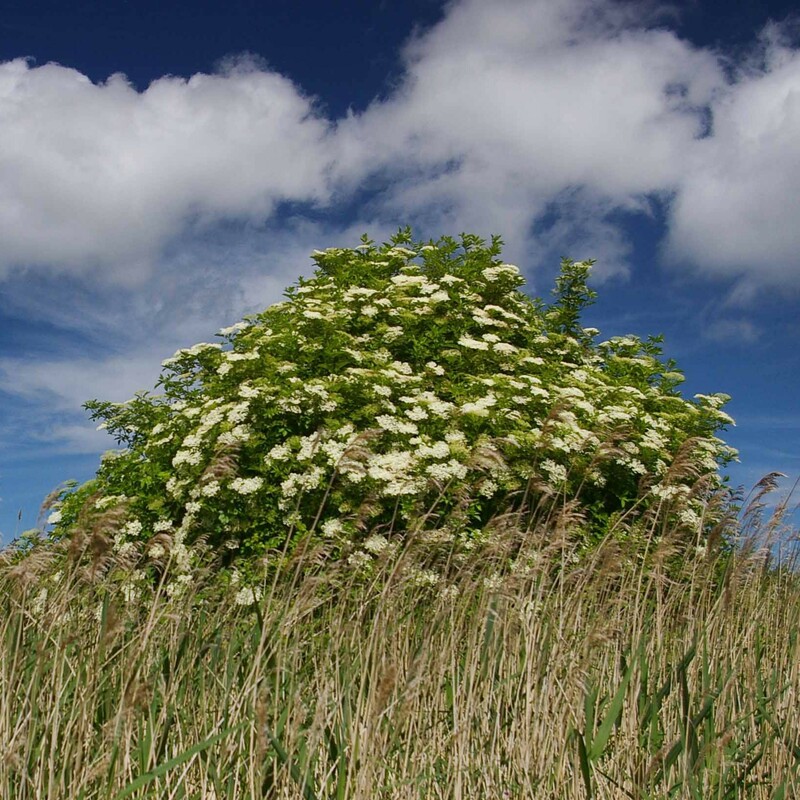 This is a place for me to share and hopefully inspire you with our ideas about food, foraging, gardening and anything else that happens along the way! I'm a food and lifestyle writer, a recipe writer, food stylist and author with a huge passion for organic gardening and cooking with fresh homegrown produce. We grow loads of fruit and veg on our biodynamic allotment and these fantastic raw ingredients become meals that make us feel amazing, are packed full of natural energy and are super quick and easy to prepare. We're raising three ‘free-range’ children, along with numerous animals and we do everything as naturally as possible. No chemicals, no additives, no nasties. Just heaps of goodness and lots of fun! Happy reading and I hope you have a great big, smiley, happy, healthy day!